Imagine one of the big banks or manufacturers turning their corporate website into a social website, allowing readers to comment on press releases, or inviting users to rate executive bios? That would be amusing, but not realistic. A social business (referring to the common definition associated with enterprise technology, akin to enterprise 2.0, and not to be confused with the similar label used to describe socially and community-minded organizations) is one that actively uses and weaves social media technology into many or most aspects of content consumption by the target audience — outside and inside the business. Most of the social activity of a social business is internal, on the corporate intranet. Social business is not exclusively internal (you should still have websites with social qualities, a Twitter account, etc. ), but it is mostly internal. A social business has a social intranet, and that intranet is the hub of social activity. Socializing your internal business (socializing your intranet) need not be expensive, but it does require careful thought, planning and change management. 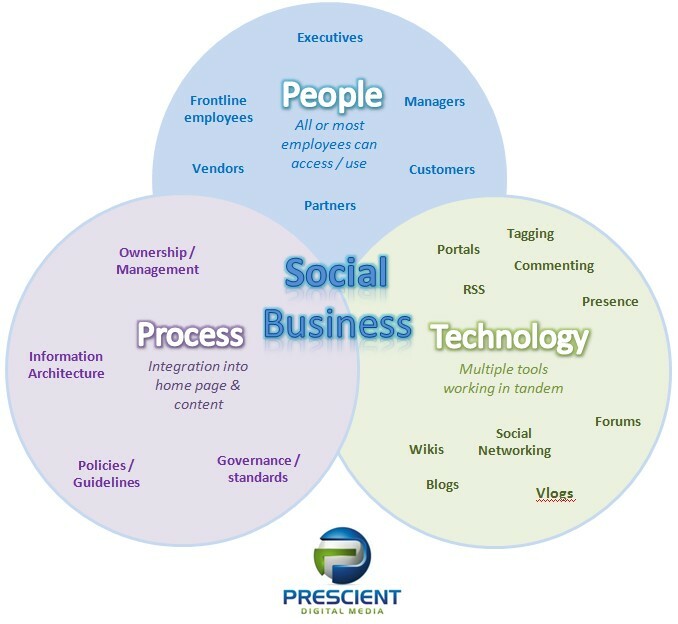 First and foremost, a successful social business has the right mix of people, process, and the supporting technology. Employee engagement is extremely important in organizations and what can be better than having a social intranet for that. A must read and extremely useful blog post.